Struck in order to commemorate the 100th anniversary of the Easter Rising. Strictly limited to 1,916 worldwide. Features the GPO on the design which was a building of significance during the rising. Accompanied with a certificate to authenticate the gold medal. 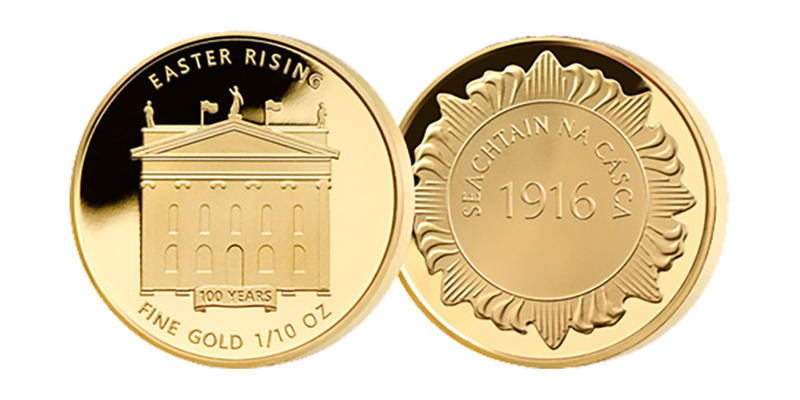 2016 marks the 100th Anniversary of the Easter Rising and this 100th Anniversary 1/10 oz Gold Medal is the perfect commemoration for this historically significant event. This exquisite gold medal captures one of the key symbols of this seminal event in Irish history. The obverse depicts the General Post Office at the centre as it was the GPO that had set an impressive stage for the drama that was about to unfold in Easter Week 1916. It was the headquarters of the provisional government, and it was on the front steps of the GPO that Padraig Pearse read aloud the Easter Proclamation to a modest crowd of onlookers. The reverse of the Gold medal depicts the original 1916 Medal reverse design that features the Irish Gaelic inscription: “SEACTAIN NACASCA 1916”, which is translated to “Easter Week 1916”. The original 1916 medal was struck for the 25th anniversary of the 1916 Easter Rising, and at that a special commemoration Parade on Easter Sunday 1941, the medals were awarded to those with proven military service during Easter Week 1916. The reverse features a laurel design inspired by the original 1916 medal and the inscription: “SEA TAIN NA CASCA 1916”. The GPO – the headquarters of the provisional government.